In Africa, on the border between the States of Zambia and Zimbabwe there is " smoke that Thunders" or "Mozi " in the local language ,which is the old name to Victoria falls . 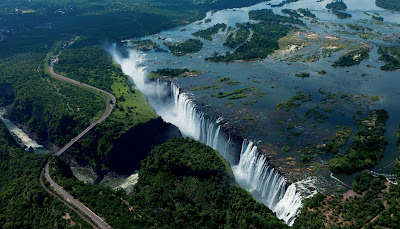 which is located on the Zambezi River.
" smoke that thunders" or " shocking smoke" the name reflects the scenery of waterfalls where the water flowing from the top down in a loud voice, rolled the region a thick watery mist call it "the fog detonator", came the name of Victoria after he Visited the first European and Scottish Explorer David Livingstone in November 1855, and named it this name because of Britain's Queen Victoria, but it is still known by both names, also The only island amid the waterfall in Zambia holds name the Explorer Livingstone. the waterfalls Stretching along the 1.7 mile, and height of 108 meters, so it is higher than Niagara falls which its maximum height 56 m high, competed strongly Iguazu falls between Brazil and Argentina. The rainy season in the Zambezi River basin which feeding the falls from late November to April, prevailing the drought the rest of the months of the year, and flood peak in April, up water spray from waterfalls to higher than 400 m, sometimes up to twice this height, and can be seen from a distance of approximately 50 km. 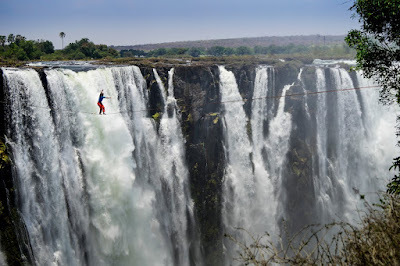 There is a famous pond was formed naturally known as ' Devil's Pool ' near the edge of the waterfall, and is accessed via Livingstone island in Zambia, and destination by tourists for swimming, but especially during the flood season had some accidents and deaths are reported from time to time when sliding swimmers and fall at the waterfall from this soaring. And between the two neighbouring countries Zimbabwe and Zambia there is a famous bridge crosses the Zambezi river above the falls, and so visitors can see the waterfalls clearly beneath them directly during transit above a significant rise from the water, so not recommended for the faint of hearts crossing over this bridge because of the significant rise which may not suit everybody. 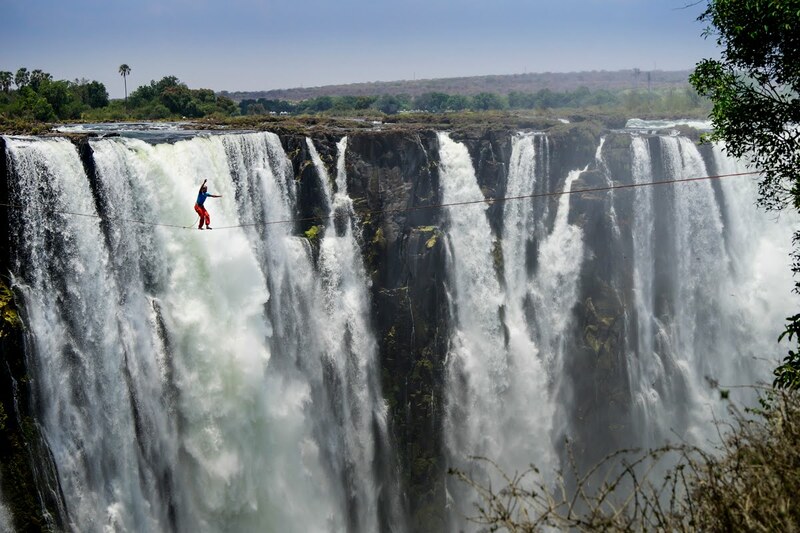 Victoria Falls area is known as "Adventures capital of Africa", offering all favorite sports for enthusiasts adventures and researchers from the excitement such as fly over Victoria Falls, skydiving during flight in the river or waterfall. Although the falls are the main features of the place, there are other places such as the National Park along the Zambezi River ,which is in its scope the waterfalls, the Park extends over an area of 66 square kilometers, the Park's managers plan to expand it, the garden includes a variety of animals such as elephants, giraffes, Buffalo, Zebra, rhino, along with various types of birds. Allows both Zambia and Zimbabwe for tourists visiting Victoria Falls easily and without complications, and day trips can be made from both sides, and by the end of 1990 the visit reached average to 300,000 people a year. Admission ticket costs 20 dollars on Zimbabwe, and ten dollars on the Zambian side, there are regular changes in visa regulations, so visitors should review the rules before crossing the border. 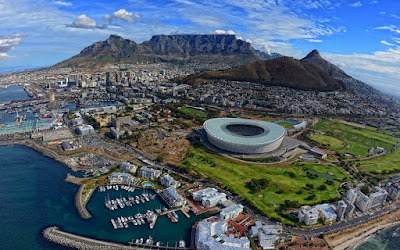 Victoria Falls can be reached by car, bus, plane, where organizes British Airways and South Africa airline a day trips between Johannesburg and Victoria Falls airport, there are flights between Victoria Falls Airport and other destinations within Zimbabwe. Also accessible by rail from Zambia or Zimbabwe, these classic way to reach the falls allows to enjoy spectacular views and wildlife sightings during the trip. The train moving from Bulawayo in Zimbabwe to "Victoria Falls Station", first class ticket costs about $ 12, leaves Bulawayo at 7: 30 p.m ,arrives at 9 a.m. the next day, with a note of delayed trains and its schedule irregular.